so, you've been teaching yourself to SEE, right? your eyes are opening, you're looking around, you're seeing patterns in the world, things that delight your eye and speak to your soul. perhaps you're starting to or are keeping a sketchbook, a scrapbook, making a pile of delightful and inspiring scraps, or putting them on a board. perhaps you even made a bona fide inspiration or mood board. chances are, your eyes (really, your mind!) are opening up and you're seeing that details really make the difference. the angel is in the details, really, not the devil. details are truly what make things special, and different, and unique. anyone can own a pair of jeans, or a white button down oxford style shirt, but it's the quality or texture of the fabric, the neatness and deliberateness of the stitching, the little unique design features (pleats, piecing, pintucks, the shape slant of a pocket, a fancy button, the innovative shape of a leg or sleeve, whatever!) that make something stand out. and by extension, these details can help tell the story of your own unique personal style. they take something very utilitarian, our everyday clothing, and elevate it to another level. they enrich our adornments and by extension, our personal story or statement. the special details that you honestly and soulfully choose and the manner in which you mix them together is likely to say something completely idiosyncratic about you...and that's the point. i'll let you in on a little secret: the details are the fun part of fashion (and really, all of art and design! ), and they are out there just waiting for you to notice them. to illustrate, i show you these two lovely pairs of shoes i thrifted recently (and also posted about quite recently, here). 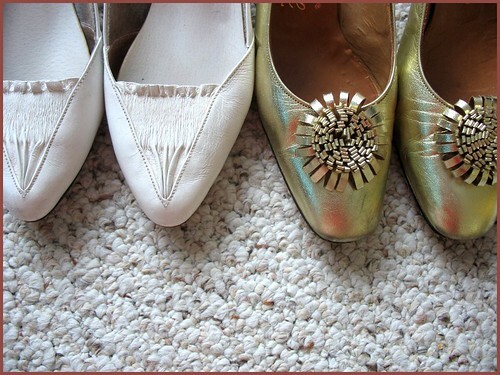 the white pair on the left had this amazing ruched triangular section on the toe, something very interesting and unique that set them apart from other shoes on the rack. had they been plain white pumps, i would have been more likely to pass them over. a little detail like that shows that the designer was thinking, experimenting, pushing, trying. it doesn't get up in your face, but it adds an extra edge. the same is suggested of you, if you notice, embrace, and wear these sorts of details, or any details of any kind that appeal to you. it shows you are LOOKING. you are also making unique, very personal choices, and being yourself. as was suggested above, details also speak to the quality of an item...and in turn, speak to your inherent or growing intelligence and education on the subject of fashion, even if you don't intend to eventually become an expert. just knowing a *little* enriches you quantitatively and qualitatively, and actually makes lovely new connections between synapses in your brain! wow! totally cool. pick up a book on fabric, sewing or fashion details from your local library, thrift store, or used/new bookstore, and page through. examine the pages on fabric, seaming, and the like. understand that some design and manufacturing processes take longer than others, some fabrics and pieces of clothing are harder to make, some are made of materials that take time to produce, and procure. all of these factors factor into the cost and quality of a garment, in the end. train yourself to recognize fabrics, and what feels good and what feels bad or cheap. chances are you know, inherently, with just a touch. use all of your senses. just being aware of good quality of fabric and the extra time and processes that occasionally go into making higher-quality garments will earnestly assist you when combing the racks at the discount or mass-market shopping establishments, websites, or the thrift or secondhand stores. you can root out good, quality pieces that make an original statement about you...that show you are LOOKING and THINKING. 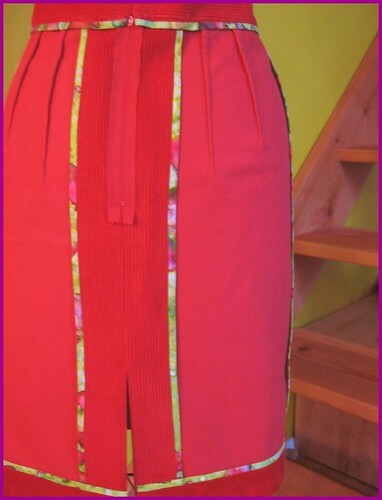 here, i've made a simple straight skirt...but inside, i've finished off each seam with hand-made bias tape. sure, i could have simply left the seams bare, allowing them to fray, or could have serged (overlocked) them for the sake of brevity or really, laziness, in order to have a skirt to wear. i take shortcuts like that sometimes myself, we all do. but in this case, i took the extra time to find a coordinating tape to use as bias, cut the bias tape out by hand, and applied it to all the seams. i took the time and effort and sewed each seam and it's bias tape as carefully as possible, trying to stitch in the ditch so the stitches wouldn't show. i hemmed the skirt by hand, making sure not to prick too deeply or sew haphazardly so that the thread wouldn't show on the outside of the skirt. i paid attention to the details...and this attention pays off. this skirt will last because i took the time. one of my professors at parsons, darcy meeker, always used to say, "the long way is the short way." in other words, do it right the first time, and you won't have to go back and do it again, or put it back together or buy a new one when it falls apart, when it wasn't done right in the first place (think of all the cheap mass market stuff that disintegrates within a few washings or wearings, UGH!). look for things that were done right the first time. things made with care. things that were made with and eye for and attention to detail. this type of seam finish, or any other carefully worked seam finish suggests extra care, and hand-work on the part of a garment maker or manufacturer. seam finishes that appear to have been worked by hand, neatness or extra design details or lots of piecing suggest that a garment maker or manufacturer may be signs that you have a good quality piece on your hands...fine, detailed hand-work and beautiful hand-sewing is a huge part of true haute couture clothing, in fact. i implore you to turn any potential garment you're thinking of buying inside out...the inside of a garment says almost as much as the outside. it could mean the difference between having a piece that lasts and continues to make a statement, and a trendy, cheaply-made piece that lasts barely one season. good quality can be rooted out just about anywhere, if you have trained yourself to LOOK and THINK and notice the details.